The components of basic dietary staples including dairy, grains, fruit and vegetables are combined into Soylent and sold as an instant replacement for a balanced meal. Though developed to be mixed with water and sipped, many early consumers have found the taste too bland and are tossing Soylent into traditional recipes to make cookies, boba and oatmeal. 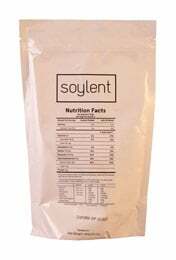 Soylent’s ready to drink “version 1.3” (released at the end of 2014) is a powdered nutritional shake mix that is the commercialized version of the do-it-yourself recipe (which can be found on the Internet). Designed to satisfy all nutritional requirements that the human body needs, Soylent’s 15.2 ounce bag of mix is meant to be divided into three servings (approximately 22 fluid ounces each when mixed according to the instructions),one to replace each meal of the day. Each serving has 510 calories, 2g of sugar, 10g of fiber, 38g of protein, and almost two dozen vitamins and minerals, representing 33 percent of the recommended daily allowance per serving (you’ll hit 100% if you consume the suggested three servings per day). Ingredients include loads of vitamins and minerals, but also more pedestrian ingredients such as oat flour, rice protein, maltodextrin, gum acacia, soy lecithin, salt, artificial flavors, xanthan gum and sucralose. In addition, version 1.3 includes a 1.97 oz. bottle of oils that is added to the mix (version 1.4 has eliminated the need for the bottle of oil). Ultimately, these ingredients are what you taste when you consume the product as the mix doesn’t have a heavy vitamin note to it. It’s largely pasty and starchy in its consistency and flavor — and it leaves a coating behind in your mouth. While there are flavorings and sweetener added, there isn’t exactly flavor or sweetness to the product. It’s pretty clear that the product has been intentionally left devoid of anything that might create a positive sensory experience. The same can be said about the packaging, which has branding that looks like it’s military grade rather than something that’s actually being sold in the marketplace. Oddly enough, this completely works in the perceived value and efficacy of Soylent. The product is designed for efficiency and affordability and there’s no waste on flavors or fancy packaging. From our perspective, this approach is actually quite superior to many of the powdered protein mixes that we’ve sampled over the years. Those products often have overly fake flavors that are loaded with artificial sweeteners and sold in complicated text heavy packages. The simplicity of Soylent is pretty hard to argue with when comparing it against stuff like that. Overall, Soylent definitely feels like a potentially disruptive product, but more so in the diet and nutritional shake space than disrupting the way we eat and drink in general. And for that, what the manufacturer has created is extremely innovative and well-executed.